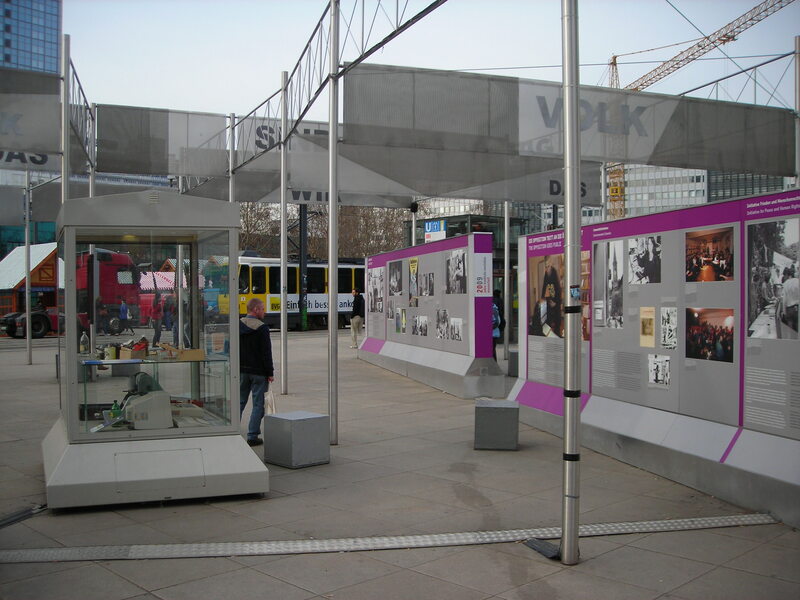 An outdoor exhibition about the Berlin Wall, Alexanderplatz, Berlin. Could we go one further and not even put the objects in cases? You know how I’m obsessed with geotagging objects, right? We lost a lot of meaning when we separated artifacts from their places of origin in order to assemble our museum collections—especially in the case of our local history collections—and geotagging gives us a chance to get some of that meaning back. I preach about this concept to anyone who will listen, and I’ve even played around with pinning some objects from New-York Historical Society‘s collection to the Google Map in historypin (until historypin told me to stop because they want people to stick to photographs). This evening I had a conversation with Chris Chelberg, a library science grad student I met back in May at THATCamp Museums NYC. We were following up on a session Chris led at THATCamp about disruption theory, Clayton Christensen’s argument from the business world that the real threat to established companies comes not from their conventional competitors—the companies selling the same product they are—but from products brand new to the market that offer a “good enough” solution to fill the consumer need at a much cheaper price. At first these new products are so shoddy that the established companies don’t pay any attention to them, but eventually they improve to the point where they take off, and by then it’s too late to do anything about it. Christensen cites a number of real world examples, the most interesting of which (to me at least) is that online degree programs like University of Phoenix have the potential to disrupt universities like Harvard and Yale: online learning might seem like no match for such prestigious schools now, but it’s getting more and more sophisticated with time, and it fills the need for a credential at a fraction of the cost. If disruption theory is new to you and you want to get caught up, you can read Christensen’s books, or I recommend this short and sweet New Yorker article by Larissa MacFarquhar. Chris and I were talking about potential disruptions to museums; can we anticipate them and how they will affect our work? One of the big challenges museums face is the burden of caring for their collections. This is an essential function of museums, mind you, but it is so expensive that it leaves us particularly vulnerable to disruptions from cheaper, more flexible sources. We talked about the things that museums think are poor quality but that the general public often thinks are good enough, and cheaper: popular historical fiction, video games, anything labeled edutainment. Community-curated exhibitions. Pop-up projects. Reproductions. This last one elicited the most interesting conversation. Right now, reproductions are no match for the real thing, and museums hold tight to the notion that authenticity is their trump card. I firmly believe this myself; In fact I wrote about authentic objects in History News last year. But maybe it’s just that reproductions are no match for the real thing yet. Is it possible that in 5-10 years they will be good enough? Are you following what’s happening with 3-D printers these days? What Chris and I came up with is that maybe 3-D printing, as it evolves, can finally address some of the major access challenges museums have been grappling with for years. So we put everything in glass cases because we don’t want visitors handling and stealing our precious artifacts. But who cares what happens to the 3-D reproductions? Let them get breathed on and licked and caressed to death, Velveteen Rabbit-style. Put them in a room without climate control; heck, put them outside. Which leads me back to geotagging. I would love to see a city museum take 100 of its most significant objects, partner with a 3-D printer manufacturer (or better yet, as Chris suggested, crowd-source it to the local maker community), and then install these 3-D reproductions out on the streets, where the original [authentic] objects came from. What would we learn from such an experiment? Could we own the disruption? Let me know if you want to find out.